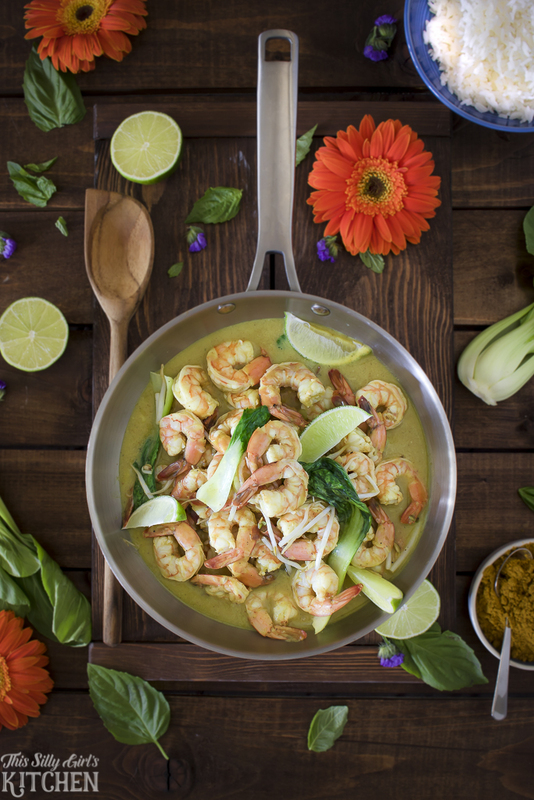 Coconut Curry Shrimp, shrimp, and baby bok choy coated in a luscious lime coconut curry sauce! It doesn’t get much better than this curry shrimp! First of all, thanks go out to The Fresh Market for sponsoring this post! Everything pictured was purchased at one of their Jacksonville, FL stores! 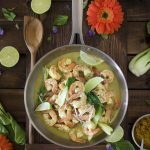 With 100% certainty, I can say I love The Fresh Market AND this recipe for Shrimp Coconut Curry! I actually got this recipe off of The Fresh Market website. I really wanted to try out one of their recipes because they all just looked totally delicious and most of them are 30 minutes or less which is a huge plus. I picked up my other produce goodies like ginger, onion, and bean sprouts, then grabbed some of their delicious shrimp! I just can’t get over how fresh everything is. I know you know that smell in other grocery stores that just seems to linger over the seafood display… you won’t find that here! I know, this curry recipe might seem a little intimidating but it’s really not. Just get all your ingredients out and ready to go before hand! 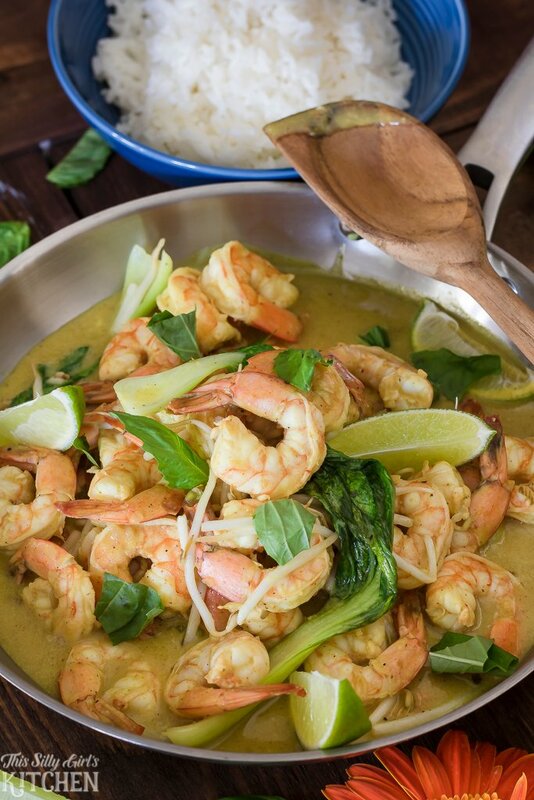 This dish is so flavorful and bursting with that creamy coconut lime sauce! Sautee onion, garlic, ginger, and chilies. Stir in the curry powder, coconut milk, and lime juice. Season shrimp then add to sauce. 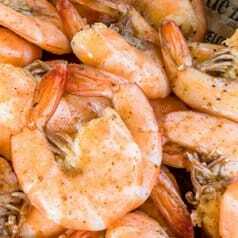 Cook for 3 minutes or until shrimp are fully cooked. Add in the bok choy for 2 minutes. And, those shrimp I got were so plump and juicy. The sauce coated them beautifully. That rice is a must to soak up all that lovely coconut curry sauce! 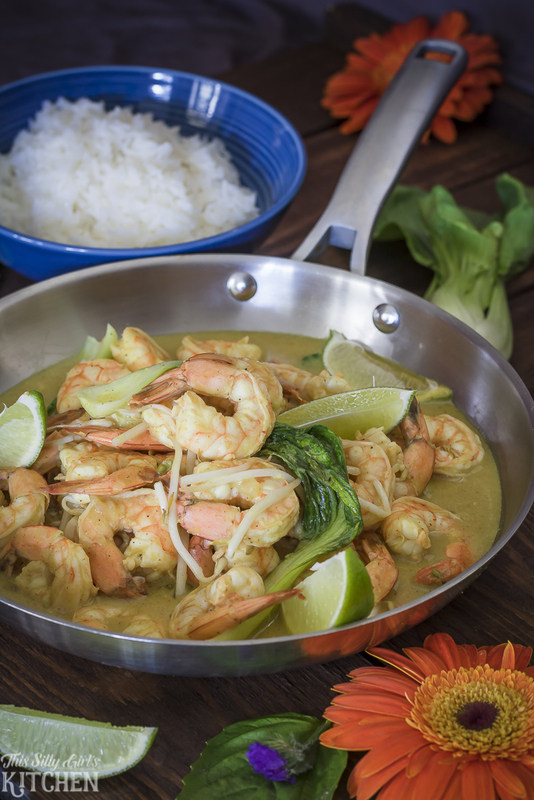 This shrimp curry is full of flavor and not too spicy. Obviously if you add more peppers it would be spicier! I really hope that if you are in the Jacksonville, FL area you will come and visit The Fresh Market! Seriously one of my favorite stores! Thanks so much for taking the time out to spend a few minutes with me and I hope you enjoy this yummy recipe! 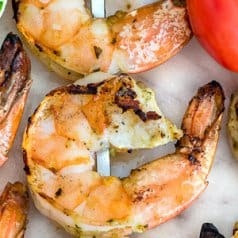 If you like this recipe make sure to check out my Wedge Salad Recipe, Roasted Shrimp Cocktail, and Strawberry Cheesecake Bars! 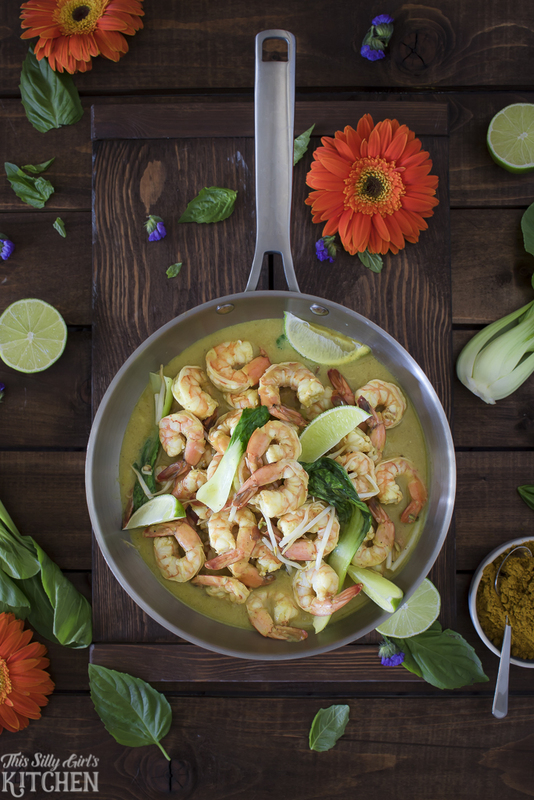 Coconut Shrimp Curry, shrimp, and baby bok choy coated in a luscious lime coconut curry sauce! Place the oil in a large, deep skillet and turn the heat to medium. Add the onion, garlic, ginger, and chilies and cook, stirring frequently, until the vegetables are tender and the mixture pasty. 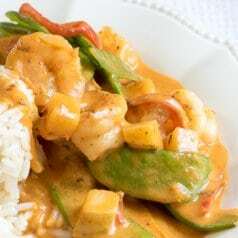 Stir in curry powder and coconut milk, and lime juice and simmer, stirring occasionally, until thickened, 5 to 8 minutes. While sauce simmers, season shrimp with salt and pepper. Add shrimp to sauce and simmer, stirring occasionally, until shrimp are just cooked through, about 3 minutes. Add bok choy for the final 2 minutes of cooking time until just barely tender. Add salt to taste and serve immediately with basmati rice and optional garnishes. 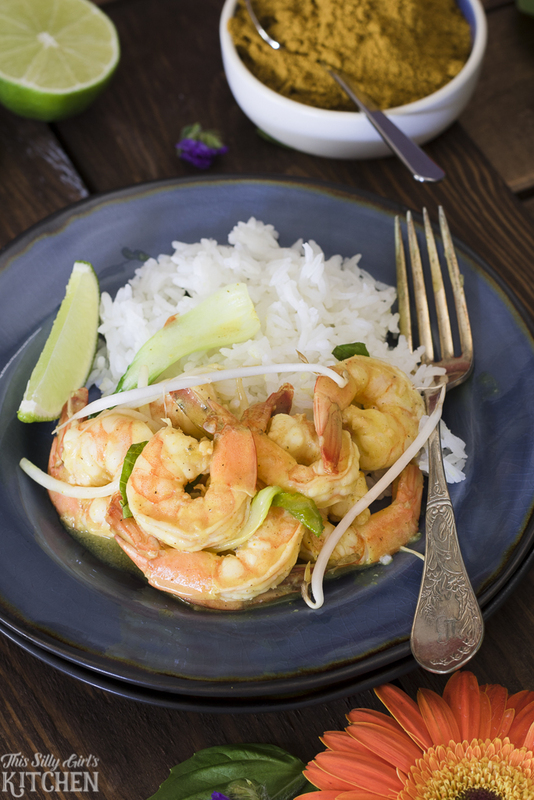 I love coconut curry and this is such a light and delicious dish, love the shrimp! 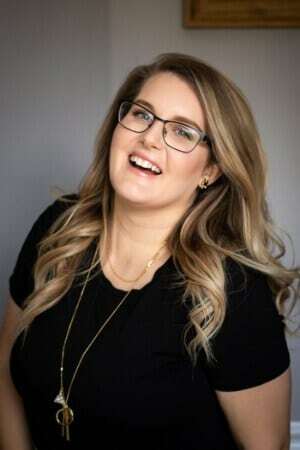 Your photos are so gorgeous! I love this combination of flavors! The shrimp looks amazing!